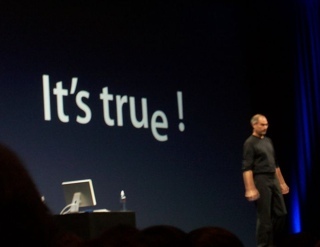 In a little while, Steve Jobs will be keynoting Apple’s developer conference. I doubt that anyone will be thinking about audio drivers. So in the remaining moments to do that, let’s go — because 10.5 looks like it’s yet another release from Apple that takes music production seriously. Discover Leopard’s support for the recently-approved USB Audio Device 2.0 class specification and how to write spec-compliant descriptors for your high-speed USB audio device. Find out how to unleash the power of FireWire peer-to-peer networking using Leopard’s all-new FireWire audio drivers and enhanced Audio/Video Control (AV/C) media services. Learn how to implement user interfaces and vendor-specific AV/C commands to control your audio device. This is great news, because typically adding driver support to Core Audio would not require anything new on the application side — meaning you’ll soon be able to plug in devices and reap the benefits, at least for things like plug-and-play USB 2.0 (provided your hardware is up to spec). Just sayin’. And this is not to be smug or launch an OS war; I genuinely hope Microsoft makes an effort to do better. Any developers at WWDC who can report back? I couldn’t fly out to San Francisco this week.